The first quote to appear in the ad (above) is from Business Insider, which stated "the Samsung Galaxy S5 does a lot of things that Apple's latest iPhone can't do." Lines from Steve Kovach's actual review didn't make the cut, such as: "Samsung's fingerprint sensor isn't as elegant as Apple's. It only works if you swipe your finger across the button, and you have to do so just right or you'll get an error message." Kovach then added, "There's one feature that baffles me, though. Samsung added a heart rate monitor to the back of the phone, next to the camera flash. It syncs with S Health, a fitness tracking app that comes installed on the phone and measures your steps and other basic health stuff, and works by placing your finger on top of it for a few seconds. Samsung says it added the sensor so developers can create apps that use it, but I still don't see the point." He also wrote, "Design snoots like me constantly criticize Samsung for making its premium devices out of cheap-feeling plastic versus metal or a denser material like the thick plastic used on Nokia's phones or the iPhone 5C. It's the same story with the Galaxy S5. "The phone is covered in the same bendy plastic as before, but this time Samsung added a textured backing that makes the phone feel a little better when you hold it. The back cover doesn't look very good on the blue and gold versions of the Galaxy S5 (the gold version looks kind of like a Band-Aid), but I didn't really mind it on the black and white models." The site's actual review, written by Larry Magid, was titled "Galaxy S5 is Very Good But Not Amazing." "I came away greatly impressed by the HTC One M8 following my hands-on review," Magid wrote, "and having now spent time with the black and white editions of Samsung's new Galaxy S5 I can confirm: any lead the Galaxy range did have has now gone." Baig's review added, "Aside from that heart-rate sensor, it doesn't break a lot of new ground. In other words if you have an S4 and are happy with it, there's no urge to upgrade." In particular, the USA Today review noted "the fingerprint scanner doesn't work as well as the similar feature Apple has on the iPhone 5s," and stated that the Galaxy S5 "doesn't come close to measuring up to the premium feel" of even other Android competitors like the HTC One. The ad cites Laptop as saying "we were most impressed with Samsung's new camera features." However, that's a line from the site's affiliated blog providing an initial first look, given before pricing information was even available. In its actual review, written by Mark Spoonauer, the publication notes that the Galaxy S5's new Best Face feature "had trouble picking out one face in a group photo." On Samsung's Selective Focus, Spoonauer wrote, "we wish you could precisely select the focal point as you can with the HTC One M8." Spoonauer also added that photos taken by iPhone 5s were "brighter overall" and produced "more detailed photos" compared to Samsung's "unnaturally bright but quite fuzzy" images (as it portrayed in a test shot, below). 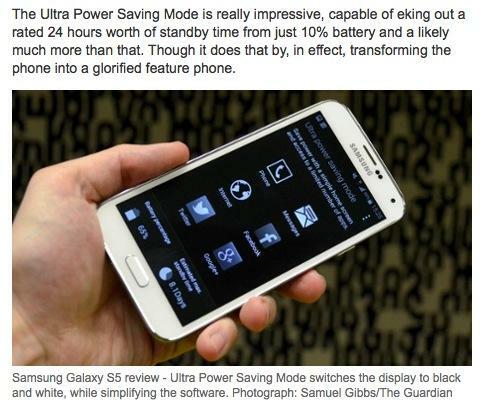 Samsung's ad next takes a line from a review by Samuel Gibbs for The Guardian: "The Ultra Power Saving Mode is really impressive." What it left behind was the rest of the paragraph, which adds, "though it does that by, in effect, transforming the phone into a glorified feature phone." Gibbs also noted that "software is where Samsung has struggled the most. The company admitted that its software needed work and dedicated half of its research and development effort to improving it in November last year. Sadly, while the software is somewhat refined on the Galaxy S5 compared to its predecessor, it still has some way to go to match the quality or experience of its competitors like Google, Sony, HTC and Apple. "Samsung calls its customisations to the standard Android experience 'TouchWiz,' and frankly they add clutter and confusion to the experience." The next line from the ad, taken from an article comparing it to the HTC One, states, "but what really sealed the deal, so to speak, is the Galaxy S5's dust- and water-resistant design." That deal didn't seem to be sealed too tightly, as that same piece also observed, "the Galaxy S5 looks much more conventional, even a bit bland, but it gets the job done and it's a lot easier to hang on to," and adds, "tor me, the Galaxy S5 won a war of attrition and either phone will make you happy in different ways. And with the LG G3 phone still around the corner, the true Android winner may still be circling our star system." Samsung didn't pull any quotes from the review by New York Times writer Farhad Manjoo, who compared the Galaxy S5 to Apple's iPhone. 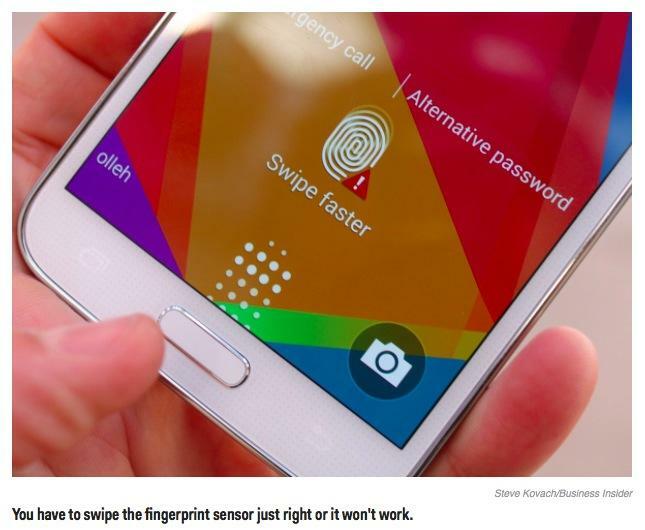 He added, "the Galaxy S5's finger sensor is unusable. It has failed to recognize my finger just about every time I have tried it. It has been so terrible that the sensor feels more like a marketing gimmick than a legitimate feature. And it makes me wonder about Samsung's capacity to keep up with Apple's innovations." Manjoo concluded, "but this year, Samsung couldn't keep up; as the speed-testing gurus at AnandTech showed, by just about every speed metric, the aging iPhone 5S beat the brand-new Galaxy S5." The final line from the ad, taken from a CNET review by Jessica Dolcourt, states, "Samsung's Galaxy S5 excels at everything that matters." However, Dolcourt also wrote that the Galaxy S5 is "only a small upgrade over the Galaxy S4," noting that "with the exception of a few nonessential hardware and software additions —like the fingerprint scanner and novel heart-rate monitor —and a few design tweaks, you're pretty much looking at the same phone Samsung released in 2013." Her review concludes, "I would, however, skip the Galaxy S5 if you like metal covering your smartphone, if you don't need every feature under the sun, or if you prefer a cleaner version of Android. Also move along if you're on a budget —in some regions, the Galaxy S5 costs significantly more than other premium handsets."